Urban Decay On The Run Palette - This gorgeous palette has just about everything you need to create a day or night time look just add your choice of foundation. I have been loving everything in this palette, if you would like to see more of it check out my review of it here. Wrenn Jewelry Bangles - I'm not one to wear a lot of dress Jewelry but when it is good quality like Wrenn's pieces are I cannot help myself. These bangles have not left my wrist for the month of April and the ring I got from them awhile ago (review here) I look forward to getting more from this company. Maybelline Master Glaze Blush Sticks - I will not go into these much as I have a full review here with swatches but this colour Just Pinched Pink has been my favourite this month. Go To Skincare Properly Clean* - This cleanser has been great for my skin as well as the face hero. The cleanser doesn't leave anything behind and gives you that freshly clean feeling while being very gentle to your skin. Review of them both here. Maybelline Color Drama Lip Pencils - Another one I will not go into detail as I don't want to keep repeating myself (full review & swatches here) great colours, very easy to apply highly pigmented need I say more! Bourjois CC Cream - So incredibly impressed with this CC cream I have used it all month well it feels that way. The coverage is fantastic and it wears really well sinks into my skin and ahh I am just in love! Delisious Skin Exfoliating Mask* - Once again I have a review of this mask here, but this exfoliating mask has been my go to for April and I have been loving everything about it. 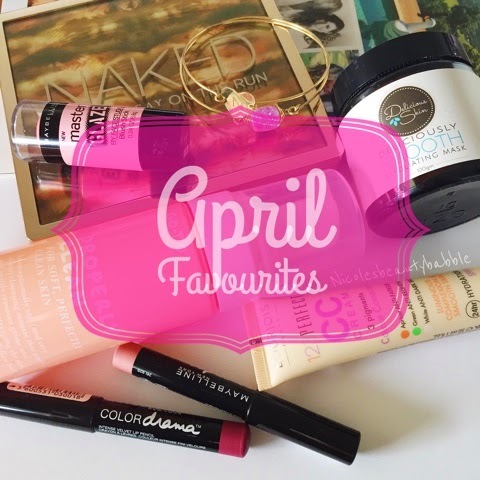 I would love to know what your April favourites were so please leave me a comment or a link to your favourites below. Loving the Maybelline lip pencils i only have a couple of them but i use them all the time! great post!